We have various mission partners across the world who are seeking to reach their local communities with the Gospel of Jesus Christ. Dávid and Jenci Hamar (and their three children) are from Hungary. They currently live in Budapest. 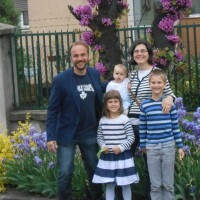 Dávid works as a pastor in a church plant in largely student area of Budapest. Both Dávid and Jenci also run a home brewing supplies company to help supplement their income. Wonderful to hear from you on Sunday and in this video! Good to know what you’re up to and how we can pray. Cool backing track on the video and sorry on behalf of young British males for our behaviour on your trams…! Thank you for this very good insight in to your lives. It will help us to pray for you.